Following Steiner’s untimely death, Polzer-Hoditz fostered a broad range of friendships and alliances with key figures such as D.N. Dunlop, Walter Johannes Stein and Ita Wegman. In a bid to avoid further division and conflict, he made significant interventions to alter the tragic course of events that consumed the Anthroposophical Society, although he was unable to stop the major split within the membership that was to follow. In the final decade of his life he concentrated his energies on world issues, seeking to influence events in Europe in particular, lecturing widely and writing a number of books and memoranda. In contrast to the destructive ‘special interests’ of the national and religious groups that craved dominion and power, Polzer-Hoditz sought to build a true understanding between Central and Eastern Europe and to cultivate a spiritual connection with the West.Steiner's untimely death, Polzer-Hoditz fostered a broad range of friendships and alliances with key figures such as D.N. Dunlop, Walter Johannes Stein and Ita Wegman. In a bid to avoid further division and conflict, he made significant interventions to alter the tragic course of events that consumed the Anthroposophical Society, although he was unable to stop the major split within the membership that was to follow. In the final decade of his life he concentrated his energies on world issues, seeking to influence events in Europe in particular, lecturing widely and writing a number of books and memoranda. In contrast to the destructive "special interests" of the national and religious groups that craved dominion and power, Polzer-Hoditz sought to build a true understanding between Central and Eastern Europe and to cultivate a spiritual connection with the West. Meyer’s book is a pioneering work in biographical literature, structured in four main sections that reflect the stages of an individual’s personal development. In the concluding section he studies world events up to the present day, practising a method referred to as a ‘symptomatological observation of history’, which Polzer-Hoditz himself sought to develop. 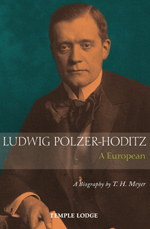 Much more than a standard biography, Ludwig Polzer-Hoditz presents a vibrantly living picture of how a spiritual individuality can work in human culture and history – in past, present and future. This first English edition is based on the latest German version and features additional material. T.H. MEYER was born in Switzerland in 1950. He is the founder and publisher of Perseus Verlag, Basel, and editor of the monthly journal Der Europaer. He is the author of several books including D.N. Dunlop, A Biography; Rudolf Steiner’s Core Mission; The Bodhisattva Question; Clairvoyance and Consciousness and Reality, Truth and Evil, and editor of Light for the New Millennium. He has written numerous articles and gives seminars and lectures around the world.